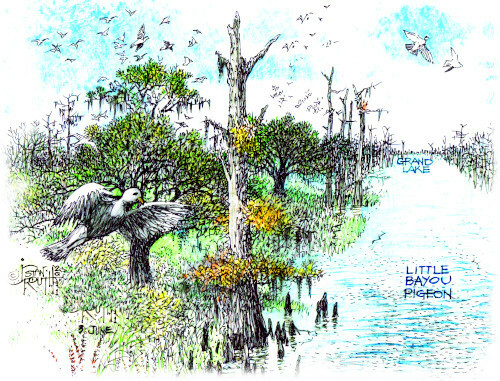 From 1806, when the first European explorers paddled by an oak ridge, where there were thousands of pigeons feeding and roosting and gave the place its name, to approximately the 1970’s, “The Spirit of the Atchafalaya” has thrived in the community of Bayou Pigeon. Sugar Plantations were established prior to the Civil War, cypress timber became the main industry in the early twentieth century and a fishing culture followed the First World War. The Cajun heritage of faith, family, self-reliance, hard work and creative use of natural resources are the pillars of Cajun culture in Bayou Pigeon. Cliff “Chachie” LeGrange, Adam J. Landry, Geraldine “Cherry” Settoon, Jim Landry and Patricia Settoon have given the gift of time and research over two decades and three years of study and selection from countless photos, court records and personal interviews complimented by illustrations of events for which no photographic evidence remains but prepared from verbal descriptions and memories. This treasure of historical information is presented to preserve a culture that has passed gradually with the hope that this and future generations will appreciate the story of "Bayou Pigeon, Louisiana - Spirit of the Atchafalaya."